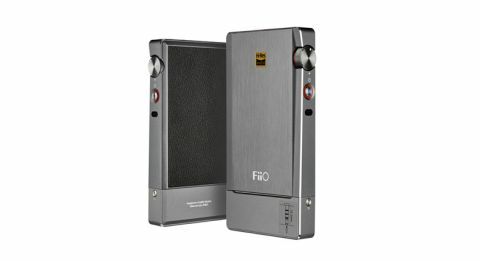 Fiio Q5 review | What Hi-Fi? Our experience of Fiio has, so far, been of good or really-very-good products in the portable digital realm. While we have tended to prefer the company’s more budget-orientated products, it’s not at all shy of putting its head above the parapet and slapping a premium price on some of its equipment. That’s certainly the case with the Q5 headphone amp/digital-to-analogue converter. A £329 asking price places it up against some proven front-runners, particularly Oppo’s £289 HA2 SE and Chord’s mighty Mojo (£399). Happily for the Q5, Oppo is preparing to ditch its audio business and the Mojo (despite what Chord says) isn’t anything like as portable as this Fiio. But can the Q5 press home these perceived advantages? The Q5 is pleasingly proportioned, and purposeful without seeming unwieldy. And at just 195g it’s not going to ruin the line of your jacket if you do take it out and about. The Fiio is built mostly from CNC’d, sandblasted aluminium that looks and feels befitting of its price. The back panel is almost entirely occupied by a slice of polyurethane leather, offering some grip and protection when the Q5 is lying down. All the moving parts operate smoothly, the standard of fit and finish is unarguable, and the whole thing does the ‘understated elegance’ thing pretty well. The ‘Hi-Res Audio’ sticker on the front is the gaudiest thing about the Q5, which is no mean feat for a product of this type. The diminutive Q5 really does need to be supplied in a box much bigger than the product itself – it comes bundled with an absolute stack of accessories. Adaptors for digital optical, digital coaxial and Lightning connection are all bundled, as is a T5 Torx screwdriver and screws in case you intend to swap out the standard AM3A amplifier for one of FiiO’s alternatives. There’s a carry-pouch and a variety of silicon pads and straps for securing and/or protecting your Q5 while it’s operating. So it should be easy enough to deploy the Q5 to work with any appropriate product from any manufacturer, using any type of connection you desire. The AMA3 amplifier section, which sits at the bottom of the Q5, is home to a USB output. It also features both 3.5mm single-ended and 2.5mm balanced outputs, making the Fiio capable of working with some quite esoteric headphones. Fiio offers a number of amp-section alternatives, so particularly power-hungry headphones can be accommodated - and, says the company, different sonic signatures can be achieved. On the top edge you’ll find a 3.5mm optical/coaxial/analogue input and 3.5mm line out, alongside a switchable gain control and an on/off bass-boost switch. Down the left side are play/pause and forward/backward controls, plus Bluetooth pairing and a USB charging socket. On the right is the rotary volume control and a power on/off button, plus a little ‘DSD’ window that lights up if you’re listening to DSD files. On the front, there’s a narrow strip of light, which glows in one of six colours, depending on the input source (or red, when battery life is low). According to Fiio, the 3800mAh battery is good for between 10 and 20 hours of constant performance, depending on the task(s) the Q5 is performing. Inside there is a pair of AKM AK4490EN DACs, able to handle audio up to 32bit/384kHz and DSD256. There are seven drop-out filters (one each for volume control, amplifier, DAC, line-out, aptX Bluetooth, low-pass filter and microprocessor), each with its own power supply. MORE: aptX HD Bluetooth - what is it? How can you get it? We begin with the Q5 attached via USB to a MacBook Air and open up one of our numerous Tidal playlists. Kamasi Washington’s entirely successful retooling of Claude Debussy’s Clair de Lune is delivered in fine style, from the opening piano motif to the full-on big-band-plus-chorus towards the end of its 11-plus minutes. The piano rings and rumbles convincingly, there’s ample texture to sound of the upright bass, and Washington’s saxophone grumbles and whines irresistibly. As far as tonality goes, the Q5 is a talented performer. It’s a nicely even-handed device throughout the frequency range, too. Amanaz’s Khala My Friend is a poised listen, with no undue emphasis given to any specific frequency area – and the Fiio doesn’t underplay the constant tape-hiss that accompanies this early-70s Zamrock classic. It simply hands over the information in as natural and unforced a manner as any nominal competitor. Switch to something a little more demanding, though (such as GoGo Penguin’s Raven), and ‘natural’ and ‘unforced’ can become a little close to ‘undemonstrative’ and ‘undynamic’ for comfort. The Q5 keeps a firm grip on the tune, but in doing so it takes away some of the dynamic abandon the band seeks to inject. Too much control can be as deleterious as too little, and the borderline-frantic nature of the track isn’t communicated as fully as is ideal. Still, rein it in somewhat with Adele’s take on Bob Dylan’s Make You Feel My Love – the sort of voice-and-piano recording that gives your system nowhere to hide – and the Q5 demonstrates decent understanding of timing and integration. There’s a tangible sense of singer and pianist in a simpatico relationship. And if ever there was a recording where the Q5’s all-encompassing need to be fully in control wasn’t an issue, this is it. You’re spoiled for choice where products of this type are concerned – but the Fiio Q5 makes a decent effort to stand apart from the herd. It looks the part, is specified perfectly and is built to last. If you can live with its rather hands-around-the-throat approach to dynamics, it’s well worth considering. Manufacturer FiiO Electronics Technology Co., Ltd.